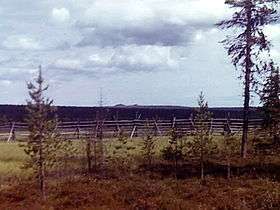 Korvatunturi seen from a distance; the "ears" are seen on the horizon. Korvatunturi is a fell in Lapland. It is located within Urho Kekkonen National Park in the municipality of Savukoski. Its name literally means “Ear Fell” in Finnish due to its unique shape. Characterised by its thick pine forest, frozen lakes and hundreds of thousands of reindeer which roam the land, Korvatunturi stands 486 metres above sea level. It has three peaks, with the middle one between Finland and Russia's borders. 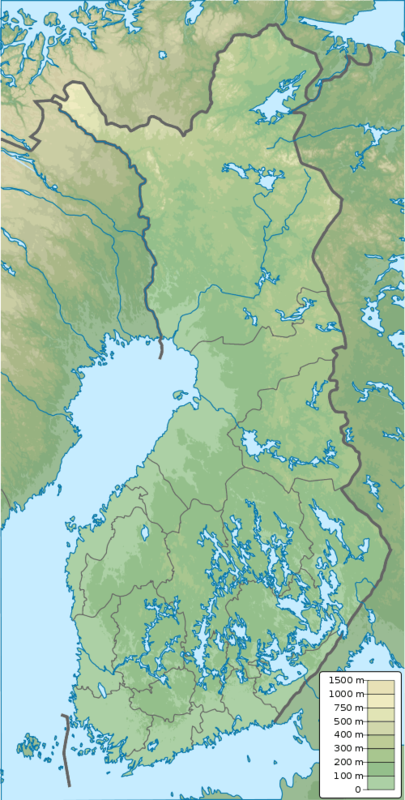 Since Korvatunturi is located within the boundaries of the country, all visitors are required to secure written permission from the Finnish Border Guard. There are also no roads that directly lead to the fell, but there are hike trails that provide access, such as the one found in the Savukoski area. Korvatunturi is best known as the home of Father Christmas (or Joulupukki in Finnish). According to Finnish Folklore, this land is the location of Father Christmas’ secret workshop, where toys, trinkets and gifts are made and eventually wrapped by gnomes. Known for their good-natured demeanour and their rôle as guardians of homes, these gnomes are also responsible for analysing weather patterns for the yearly gift-giving trip around the world. People have also said that the ear-shaped structure of the fell allows Father Christmas to hear the wishes of every child on Earth. In popular media, this legend has been adapted into the film Rare Exports: A Christmas Tale. For post to Father Christmas Korvatunturi has postal code 99999 Korvatunturi, even though all post sent to this address will actually be carried to Santa Claus Village at Rovaniemi. A 360 degree panorama from Korvatunturi. The building is a watchtower of Border Guard. ↑ Butler, Sophie. "Father Christmas in Lapland". The Sophie Buter Report. Telegraph UK. Retrieved 23 June 2013. 1 2 Robbins, Danny. "Meeting Father Christmas". Danny Robbins’ Indie Travel Guide. BBC. Retrieved 23 June 2013. ↑ "Hiking". Savukoski Wilderness Travel. Retrieved 23 June 2013. ↑ "Finnish Christmas". Nordic Recipe Archive. Retrieved 23 June 2013. Wikimedia Commons has media related to Korvatunturi.